Tom Hassenfritz Equipment Company is a family owned business with a legacy of hard work, helping farmers, and filling gaps in the Ag business in Southeast Iowa since the 1980’s. Tom Hassenfritz grew up in Mt. Pleasant, Iowa and learned about agriculture and business from his father, Bill, who owned and operated the local IH Dealership since 1958. Bill Hassenfritz taught his family the value of hard work, and the importance of respecting customers and employees alike. At the time, Bill believed that no one in Henry County would ever need a tractor bigger than an IH 560, nor would they ever have a need or pay more than $500 for a lawn mower. Bill was in the implement business until his retirement in 2000. 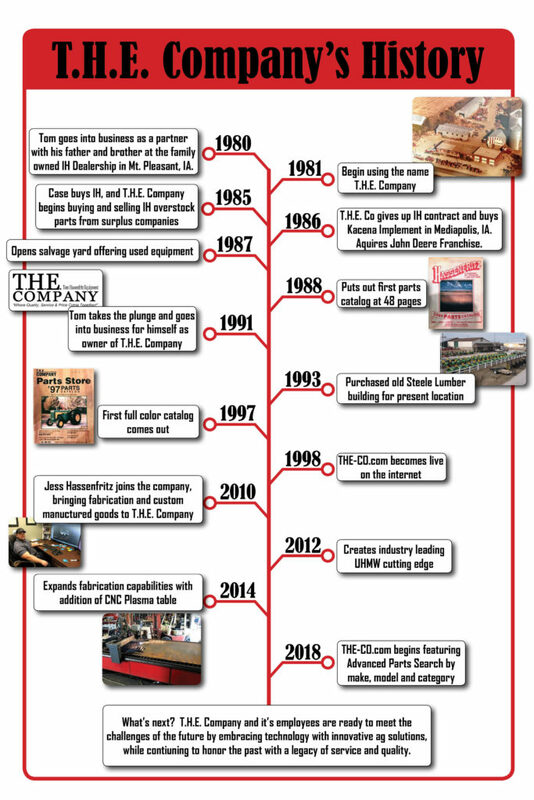 In 1980, Tom became a partner in the IH dealership with his father and brother and in 198 began using the name T.H.E. Company. He took the challenges presented by the farm crisis of the 1980’s, and met them by embracing technology and meeting the needs of local farmers by offering overstock IH parts as well as used equipment. In 1986, Tom acquired the John Deere Lawn and Garden franchise to begin offering new and used John Deere equipment. In 1988, our first catalog came out with 48 pages and was introduced T.H.E. Company as an aftermarket parts dealer. By 1995, the catalog was up to 151 pages, and regularly featured Tom’s own family on the cover, continuing the family legacy. In 1991, Tom took the plunge and went into business for himself, and serperated his business from from the implement dealership. In 1993 Tom bought the old Steele Lumber building on the West side of Mt. Pleasant, and opened T.H.E. Company’s present location. In 1998, The-Co.com became live on the internet, and has grown to an active e-commerce store shipping parts all over the United States. In 2010, Tom’s oldest son, Jess, joined T.H.E. Company bringing his degree in Manufacturing and Design from UNI, and a level of expertise in fabrication and welding that added a whole new line of custom manufactured products. With custom manufacturing capabilities in house, T.H.E. Company is able to keep costs low while manufacturing products that enhance and improve the parts and implements that are offered in our store. In 2018, The-Co.com launched a newly improved website that features an advanced search, where you can search for parts by make, model, and part type, meeting the current technological needs of today’s customers. With a family legacy in the Agriculture business, plus innovation for the future, T.H.E. Company is the parts company you’ve trusted for 26 years, and will be ready to meet whatever challenge comes next! We sincerely thank all of our customers for their past, present, and future business!